The International Mathematical Olympiad (IMO) has existed for more than fifty years. Every year, each country selects the top six high school students to compete. The students compete individually, and they are all solving the same 6 problems over the course of two days. Each day they are given three problems and 4.5 hours to work on them. Few days before the contest, the olympiad problems are chosen by the International Jury. The Jury chooses six problems from the Shortlist, a set of around 30 original, beautiful, and difficult problems submitted by mathematicians from around the world. 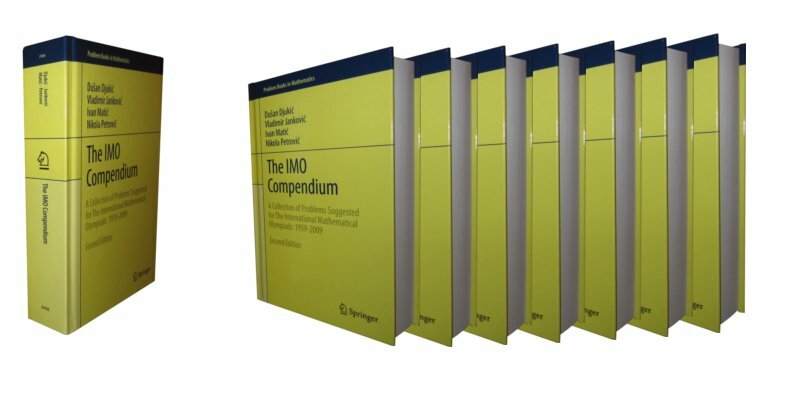 The IMO Compendium is a book that contains all problems ever given or shortlisted for the International Mathematical Olympiad (IMO) with solutions, and all of the available longlisted problems. The total number of problems exceeds 2000. Each year contains a list of short-listed problems, problems which were given at the IMO and solutions to these problems. In addition, where released for public (a practice which ended at 1992), longlisted problems are included, though not all of them are solved because the book would end up being unreasonably large. The book also contains a list of concepts, definitions and theorems not obviously derivable, which were used to solve the problems. Since we were largely concerned with only the theorems used to derive proofs in the book, the list of theorems is a good compilation of the most useful theorems on IMO competitions. The first edition of the book covers years 1959-2004, while the second goes from 1959 to 2009. In addition to new problems, the new edition has some of the old solutions reworked. We also took the opportunity to correct the errors that are found so far. In the end of the book we provide the list of authors of the problems. Here you can see and download sample pages of the book. Please take a look at the list of errors and corrections to The IMO Compendium (Second Edition).